Tricolored Update: 12:15 p.m.: Least Bittern! "Didn't see the Tricolored Heron yet today but I did get a Least Bittern and White-rumped Sandpiper. Bittern was out near the corner of the Transco and Marsh Discovery Trails and the WRSA was in the front pool near the guard shack." 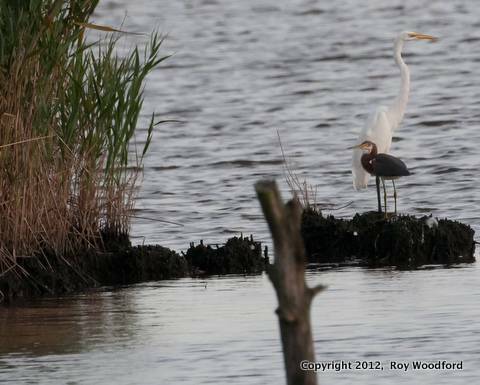 Roy Woodford got this shot of a Tricolored Heron in the Shorebird Pool late yesterday afternoon. Looks like you could see it from the shoreline by the VIsitors Parking Lot just inside DeKorte. Not sure if it is still around. Roy says: "It was around 5:45 PM on Tuesday … I was standing on the shore walk facing the Turnpike. Looking in that direction there are two islands. I had a Green Heron fly in and land on the left island. "The Tricolored Heron flew in from the south and landed between the two islands where the rest of the Egrets were hanging out. "I only got three shots before he flew around the back of the left island. It's a huge crop on that shot … even at 800mm." I had a chance to kayak the Kearny Marsh this weekend and was not disappointed. As stated in your earlier post on the blog, shorebirds have arrived in big numbers. 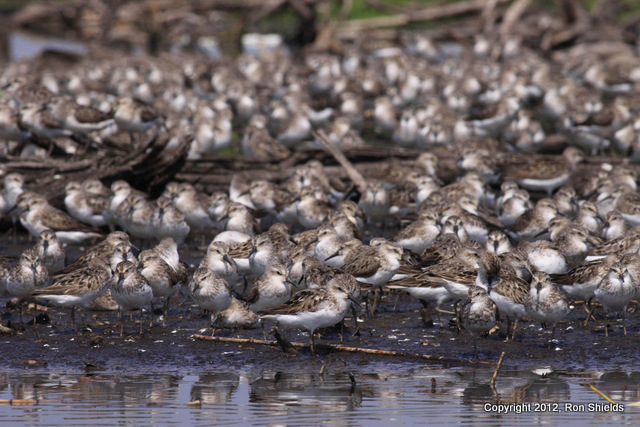 As these images suggest, Semipalmated Plovers, yellowlegs and Semipalmated Sandpipers dominated the mudflats. 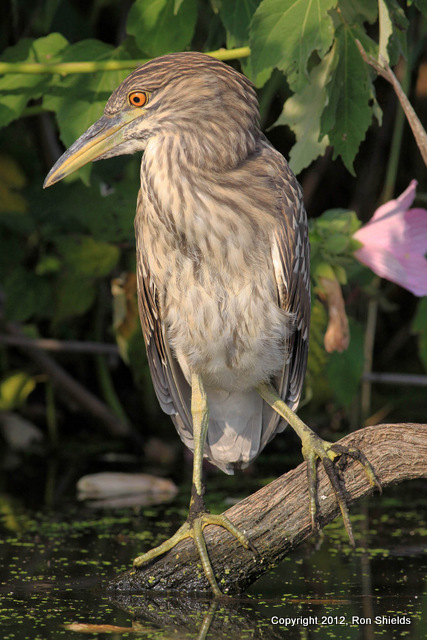 In addition, a most cooperative pair of juvenile Black-crowned Night Herons allowed for numerous no-crop photos with a 400mm lens. I sighted three Least Bitterns throughout the impoundment and had good looks at a half-dozen Common Gallinules (Moorhens), too. More pix and sightings follow. 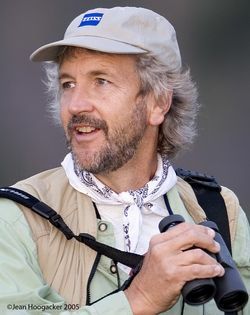 The Meadowlands Commission and the Bergen County Audubon Society are proud to present our 4th Annual Kevin Karlson Shorebird Day on Saturday, Aug. 11. Water levels in the Shorebird Poll will be lower through next weekend, so we expect to see some great birds. Bring your own lunch and beverages, sunblock and binoculars. Download a flyer here. Details follow. 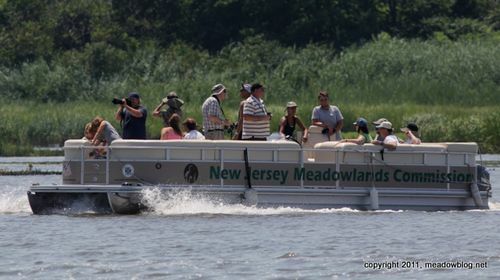 Our last Birding-by-Boat cruise of 2012 with the Bergen County Audubon Society is Tuesday, Aug. 28, at 10 a.m. We hope to see Ospreys, shorebirds, waders and plenty more. Suggested donation is (the bargain price of) $15. Reserve your seat now; seating is extremely limited at this point!